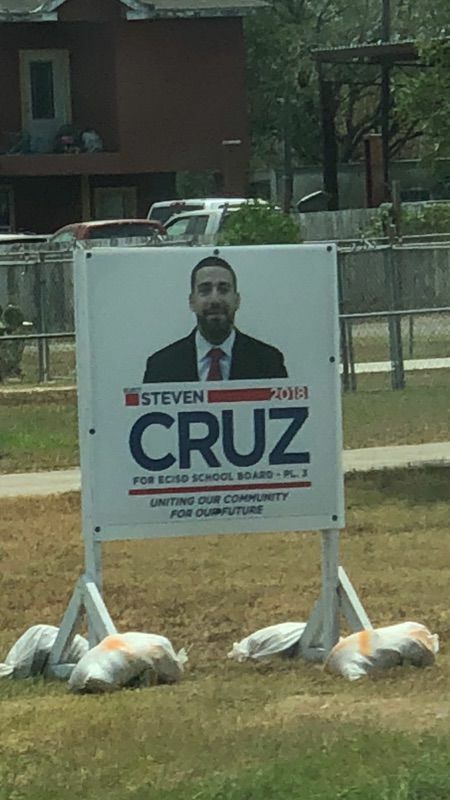 A photo of a Steve Cruz politically sign anchored by sandbags. EDINBURG — A Hidalgo County employee running for the school board here continued to provide documentation Tuesday to clear his name concerning alleged misuse of taxpayer property. Precinct 4 Commissioner Joseph Palacios launched an internal inquiry several weeks ago after rumors began to surface that county-issued sandbags were holding down campaign signs for Steve Cruz, his director of operations. Cruz and his attorney, Rudy Moreno of McAllen, have vehemently denied the accusations, calling them a politically motivated ploy, while Palacios said his office is not missing any inventory. Cruz provided a receipt to The Monitor on Monday that indicated he had purchased 56 sandbags from a Lowe’s store in Edinburg July 30. He paid $202.37 for the material. On Tuesday, Cruz provided two more receipts from the same hardware store that indicated he purchased 196 additional bags for a total of $621.91. Based on the three receipts, it appears Cruz bought 252 bags for just over $824 during a four-day span from July 26 to 30.